First of all I want to thank the administrators that allowed me to access! I’m new to this great forum and I would like to share with you my thoughts! I apologize for my English and I remind you that this is just a funny speculation that intrigues me. Please feel free to comment/criticize my ideas . Ate is the first King called by Schierke (Vol 25), as a sort of Big Chief of the Kings (Miura dedicates 2 pages while the others have ‘only’ one page). 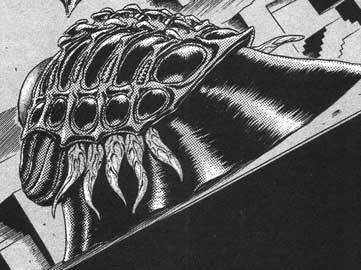 And we know that Void is the leader of the God Hand. The water flows around VE resemble the wings the ‘cover’ Slan. Here it is my weak point… maybe. Both have in common also the element, the earth (too many times we have seen Conrad manipulating and interacting with the ground). Well, Griffith is the Last and Fifth member, the Special one that reincarnates in the Physical World. For this reason he does not have a match in my schema. Man invoke God Hand with desperation to ask help in order to overcome pain. I simplified a little bit . But I could argue that the two ’processes’ have the same intent: ‘talking to God’. OK, I stop know at this point and I’ll continue later. Sorry for some language and formatting mistakes I made, but I wrote in a rush. Here are my thoughts on your idea. That seems rather unlikely. First off, the obvious: there are five members of the God Hand and four elemental kings. So right from the start, it just doesn't work. I also don't think there are too many similarities between them, and they don't really fulfill the same kind of roles either. Finally, I think there is absolutely no doubt that the kings predate the God Hand. There is no known hierarchy between the four kings. I don't know why you're pretending otherwise here. The fact there was a double page means nothing. The heads have nothing in common. And the "cloak" is an extremely superficial detail too in the present case. Given that he is the king of air, a comparison to Femto, whose nickname is the Wings of Darkness, would be more apt. It'd still be super far-fetched though. The kings are genderless as far as we know. And that parallel between water spiraling and wings covering Slan in a single panel out of the entire manga... That's super weak. Indeed, they have nothing in common... And neither do the others. Too many times? Conrad has no association with the element of earth that we know of. He came out of the ground during the Eclipse, that's all. Slan also did. It means nothing. What Conrad is associated with are rats and disease. And their bodies don't really look like each other at all either. Conrad's got a very weird body that's more horizontal than vertical, which isn't the case of the elemental king. The name is spelled Femto. And your excuse for his omission is unsatisfying. There is basically no ground to any of this. Specious parallel. Different motives, different methods to achieve it, different beings, different results. And neither ritual has the intent of talking to God. my premise was that while I love SAO (my second favorite manhwa), I was pretty sure that Youn In-wan was a Berserk fan; too many ressemblances between the characters & story. But after lengthy sessions of scanning, making picture comparisons, parallels between these 2 stories, etc, I gave up because I was starting to see things/arrange them in my head to fit in. Like, in the manga Slan has been associated with fire more than water, and Femto with wind more than any other God Hand. 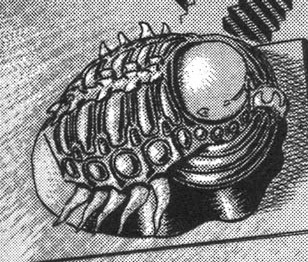 And a lot of fans all over internet suddenly thought that Conrad really looked aquatic, crustacean (like an isopod to be more precise) and it all made sense. The fake preview picture got reposted on 4chan's /a/ lots of times before the reveal, with amusing results. Just before posting the second part, it would be really interesting to know what you think about an ‘hypothetical’ relationship between the God Hand and the Four Kings. •	Do you think that the God Hand and the Four Kings have nothing in common (and so the resemblances are simply coincidences) or there is something (at the moment not clear) that put them in relationship? I don't think there's really any relationship to be found. The one major similarity is that they're two groups of very powerful spiritual beings who oversee certain aspects of the world. In that regard, maybe the God Hand was originally created to reproduce the structure of the natural world, but for mankind's collective psyche. Each member of the God Hand has his own domain and role in relation to humanity, just like each king oversees his own element. Comparing details or trying to find similarities beyond that is futile as far as I'm concerned. The one major similarity is that they're two groups of very powerful spiritual beings who oversee certain aspects of the world. In that regard, maybe the God Hand was originally created to reproduce the structure of the natural world, but for mankind's collective psyche. Each member of the God Hand has his own domain and role in relation to humanity, just like each king oversees his own element. for these reasons we will never have a perfect matching, but the best pattern possible (and my first post was an attempt). I don't think you really got my point. I don't agree at all that there are "physical resemblances" between the God Hand and the Four Elemental Kings of the world. I also don't think there is a strong case for comparison beyond what I outlined.